Considering all the predictions of a double dip recession its amazing to see a Chicago PMI in the 57 range. Especially considering the major weakness in the report was inventories down to 46.5. All other indicators remain very strong and back up our conclusions in the past that the supposed gains in inventories haven't really taken place. Today the August Chicago PMI came in at 56.7 versus the 56 consensus estimate and 62.3 in July. Definitely a slowdown from July, but any diffusion index solidly over 50 is very positive. New orders were a strong 55 and backlogs were at 56.2. The important numbers remain very positive signaling growth in the future with any support from the markets. Cash is King! If So, Why Don't Corporate Profits Rule the Market? Everybody knows the mantra 'Cash is King!'. Companies and even individuals with cash can control their destiny. Well, at least a lot more then somebody burdened with a ton of debt. That's why the disconnect between huge corporate profits and the stock market is perplexing. 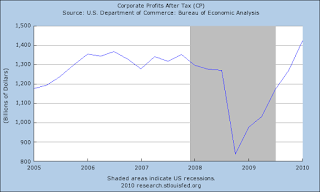 Doesn't anybody realize that corporate profits leads to cash which should rule the markets? Clearly they don't because based on 2000, its the expected future earnings that rule stock prices. Of course, that's always part of the equation. 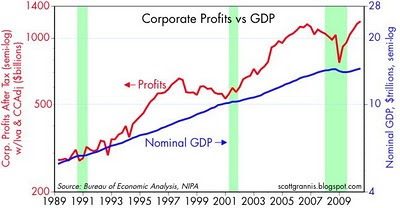 Considering history shows (see chart below) that corporate profits tend to continue upward on a regular basis except for some temporary dips during recessions. Once hitting bottom they tend not to dip any further until a new plateau is reached some years/decades later. Interesting article from the Wall Street Journal that summarizes our frustration with the current market. Rather though being the death of the Price to Earnings Ratio (or PE) the markets will likely look back in 5 to 10 years and wish they'd paid attention. Corporate profits are at record levels and companies with low PEs are likely to outperform in the next decade. Especially when considering the PEG ratio or the growth component of the earnings. Companies with growth rates higher then the PE will undoubtedly outperform. In the markets eyes though, the question remains on how to determine which companies will outperform. Some of the winners like Salesforce.com (CRM) have already soared to outlandish PEs because market has deemed their growth as transformational. The market thinks CRM will grow rapidly even in a weak economy so they've priced in the growth. Other stocks are marred with low PEs and reasonable growth estimates that have a low risk of not exceeding a 6-8 PE. What inventory build? The consistent mantra of the GDP rally in Q1 and over the last 3-4 quarter has been that inventories were being rebuilt. Now maybe a smaller decline in inventories helped GDP, the reality is that inventories have not seen but one major inventory increase in the last 2 years. Any number over 50 shows an actual increase in inventories. A lot of the focus has actually been on a higher number then the prior month such as a 45 versus a 39. * Thanks to Seekingalpha.com and Chartfacts.com for providing the ability to chart economic data now. Brian Westbury from First Trust appeared on Fox Business Network's Varney & Co. this morning and defended his optimistic view of the economy. I'll be the first to admit that Brian has been a little too positive, but to me his main flaw is that he hasn't accounted for the negativity of the media. Varney and his gang are so negative that they even question who is going to get consumers spending when they themselves have just scared everybody into hiding. Even though as Brian points out consumer spending in Q2 was up 4% to an all time record high. Though Varney is right to point out that Brian might be too optimistic, he himself claims that 1% growth is no growth. That 90K private jobs a month equuals no jobs. Come on Fox Business, its less then desirable. Its less then optimum, but isn't 'NO' growth. Your not helping by spinning everything more negative then the reality. Great interview with Jim Rodgers, CEO of Cypress Semi (CY). Very interesting to see him talk about how the economy seems booming when he listens to his customers, but while watching CNBC he thinks the world is collapsing. Just the title of the link tells the story.... "Do Chips Predict More Pain?"... The answer is NO! Global demand is booming regardless of the US housing market. 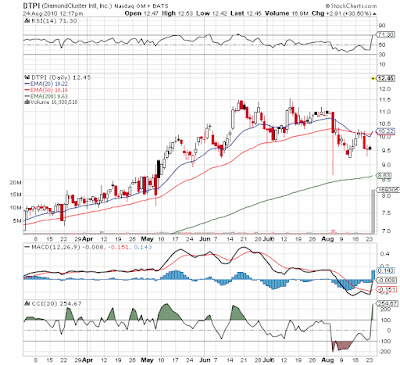 Today Diamond Management (DTPI) accepted a deal with PWC for $12.50/sh or roughly 30% over its closing price yesterday. The bid is also higher then the stock price back in April when the stock market in general was much higher. Why do I mention this deal for a stock you've probably never heard of? That's precisely the reason. With the world economy supposedly falling back into a double-dip why is PWC willing to pay a premium price for DPTI? Why is Dell & HP fighting over a relatively unknown storage company in 3PAR (PAR) and willing to pay a 150% premium? Our guess is that corporate insiders realize that the global economy is much better then the US centric people that run the media portray it. Hence they are starting to spend as they likely see the recovery gaining a second wind as we move into 2011. The market continues to roll over because of weak existing home sales even though the Richmond Fed Manufacturing report came in better then expected and still showing strong growth. After the Philly Fed reported a significant drop last week to -7 everybody was expecting the worse from this report. Richmond reported a drop to +11 for August up down from the +16 reported for July. So the report weakened but its still signaling strong growth in the 5th District.Orders, Capacity Utilization, and Average Workweek remained strong while Backlog Orders flat lined though similar to the last 2 months. Again a very solid report in an environment where the markets have priced in a double dip recession. The data outside of housing continues to not support such a scenario. Summary data from the Richmond report. MedcoHealth Solutions (MHS) provides investors the rare opportunity of a growth stock with a strong enough balance sheet and earnings to have a massive Net Payout Yield. MHS recently announced another $3B stock buyback program and they only have a market cap of $19B. That's an easy 15% yield if they spend it this year. Considering they bought back $1B+ in each of the last 2 quarters the yield is very attractive. Companies with this much cash flow just don't trade at these multiples. So far he has been 2 for 2. Kass called the 'generational' bottom back in March 2009 and again called a bottom at the end of June leading to the large rally in July. He isn't overly bullish but he doesn't see the market going much lower with SP500 earnings of $90 next year. Stone Fox is much more bullish then Kass, but we do agree with his reasoning that the tax and regulation issues holding this market back will likely start to loosen up. The Democrats have a multitude of reasons to become more market friendly as their policies of the last couple of years have done nothing for job creation and the economy. Some bullish moves should help the market going into the November election. Kass has been the best caller of bottoms over the last couple of years so we'll stick with his predictions until he is proven wrong. Not to mention that the SP500 has a ton of support over the next 15-20 points lower so its not rewarding to go short at these levels. Just reported the other day on the outflows of equity funds and into bond funds that were hitting dangerous levels. The New York Times reported over the weekend about how small investors continue to make the wrong move. This time its the movement into bonds even as corporations continue to recover. Some $33B has exited equity mutual funds at a time that billions should be flowing into the funds. Fidelity also reported that the percentage of equity holdings in 401Ks is down to 57% from a historical average of around 70%. What is scary is that small investors likely consider bond funds as safe and don't understand the risk of investing in bond funds. If interest rates go up, these bond funds will drop in price. Completely different risk from investing in a bond that you plan to hold to maturity where your just accepting company risk if they were to go bankrupt. Even though this market is adverse to risk, money is still jumping into some of the high flying techs such as SalesForce.com (CRM) or Priceline.com (PCLN) Last night CRM reported a strong earnings report that beat estimates by some 7%, but the stock trades at over 70x next year estimates. Solid report, but does it really suggest the stock is worth buying? It doesn't to us, but that doesn't keep the stock from going up. CRM is a homerun from a corporate standpoint as they are taking over the online CRM market. Unfortunately everybody has caught onto this story and the stock has soared. As usual though the market tends to trade in a heard leading to a handful of stocks hitting absurd valuations. We'd rather see investments in say Riverbed Technology (RVBD) or Terremark Worldwide (TMRK). Both have similar growth patterns and will benefit from the new move to online CRM systems and cloud computing. If Junk Bond investors (JNK) aren't scared of a double dip in the US economy, it makes us wonder why stock investors remain so concerned. After all, junk bond companies are always at the highest risk of default when the economy turns weak. Sure company balance sheets are very strong now, but that's only the companies that have high quality bonds such as IBM that recently borrowed at the unheard of 1% for 2 years. Any company that still has to pay a high yield must have a very weak balance sheet. Wouldn't have to pay high interest rates otherwise. These companies would be crushed if the economy fell into another recession. This dichotomy in the markets is perplexing. Either the SP500 will rally back to recent highs or this index will eventually roll over. 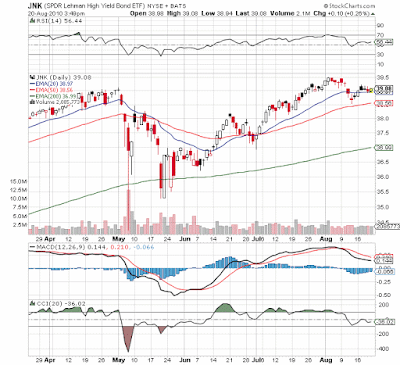 Its interesting that JNK collapsed with the flash crash and corresponding drop to lows below the flash crash, but it has since not seen the same struggles as stocks. Somebody keeps forgetting to tell investors/traders that earnings reports hardly matter at Sears Holdings (SHLD). At least the earnings per share or loss in this case. SHLD is all about cash flow, real estate, and share buybacks. Over time, Eddie Lampert will continue to shrink the shares outstanding to the point where he controls all of the company. Currently RBS Partners (Lampert) and Fairholme Capital Management (Berkowitz) control roughly 70% of the outstanding shares in SHLD. The lower the share price the easier it will be for him to buy shares and dramatically increase his ownership control. Typical herd mentality for investors to be piling into bond funds at record low interest rates. They did it in 2000 with tech stocks. They did it in 2006-07 with real estate on the coasts and now bonds. ICI reported that total equity funds had a $1.4B outflow last week and over $12B for the last five weeks. The positive news is that bond funds had a lot more money flow into them leaving the weekly net increase of nearly $6B. When the market turns it could be sudden and dramatic. Until then though, it'll be difficult to gain much ground with dry powder held by institutions such as mutual funds continually sucked out. Interesting report from Financial Times that magnifies some of the recent negative reports on copper mining activities. Stone Fox has been very bullish on copper for a while now because of the promise of high demand from China and a return of demand from the US. So far the demand from the US hasn't materialized but the production issues and lower grade ore deposits have more then offset any lagging demand. As the report shows, the top 4 public miners produced 12% less copper then in 2009. Thats while prices have been above historical averages. Its amazing how much impact analysts have these days. After the frauds in 2000 and the common thought on the street that the process is rigged, its amazing how many people still wildly follow the moves of analysts. Now with the widespread dissemination of information by the internet its even more preposterous that stocks swing wildly based on a upgrade or downgrade by sometimes randomly never heard of analysts. This morning Puda Coal (PUDA) reported a whopping 50% beat on its Q2 earnings. PUDA reported .36 while the street expected only .24. PUDA is a coal mine consolidator and producer of clean metallurgical coal in China. Being an uplisted Chinese stock it is still very untrusted and under followed. They reported $82M in revenue for the quarter so its not a small operation. Not to mention that the consolidation of 12 mines over the next year or so should add significantly to revenues creating a decent sized coal miner. Everybody currently wants operations in Australia so why not go directly to the source and buy assets directly in China? The stock trades at a significant discount to its prospects and risks currently trading at just 4x the estimated 2011 earnings of $2.17. Considering how easily they just beat the Q2 numbers those could turn out to be very conservative. The market continues to doubt these Chinese stocks but at some point they won't be able to doubt their prospects. It seems some of the developed markets still haven't figured out that China and the emerging markets rule the world now. The US was down Friday and Japan is weak tonight based on a weak Q2 GDP report. But does it matter when China was up nicely on Friday and is up another 1.3% today? The market has become increasingly technically driven making investment decisions based on fundamentals virtually worthless. Too many investors feel the fundamentals could collapse with a double dip just as they did in 2008. As I wrote in a previous entry [Coventry Health Ups Guidance - Stock Limps Higher], even a company showing fundamental improvements is ignored by the market. CVH trades at a 7 PE multiple which in normal environments would be 2-3x higher. James Altucher published a piece in the Wall Street Journalhighlighting 7 reasons why the SP500 could hit 1,500. Nearly a 40% gain from the current levels. He highlighted several reasons regarding the strength in corporate profits something that is historically important to stock prices. When the market stabilizes, profits will once again become important so its key to understand where the market could go based on current projections. Bought Cisco Systems (CSCO) for the Net Payout Yield portfolio after its follow thru selloff this morning. CSCO was down roughly 10% yesterday following what were decent earnings especially compared to their value. Does valuation matter anymore? After hours on Wednesday we wrote a little note [Cisco Whacked 7% on 18%+ Guidance]. At that point, we mentioned potentially buying the stock considering how cheap it has become so after letting the market over react we made a purchase today when it was down nearly 1% again and it closed nicely at breakeven. Way too much pain for a generally strong quarter. Remember, in the long run its not whether or not they beat revenue estimates that drives the stock, but whether or not revenue and more specifically earnings expand. CSCO has great potential on that front. This view my Richard Berner of Morgan Stanley goes a long way to back up the statements of CSCO CEO John Chambers on their earnings call last night. Though everybody chose to hark on the comments about slowdowns in June and concerned customers, he actually stated that July picked up big time. In fact, CSCO plans to hire another 3K people this year bringing the yearly increase to nearly 10%. Now is that suggestive of a company concerned about a meaningful slowdown or somebody just providing a conservative outlook? You be the judge, but the latter is much more likely. And really were you surprised that CSCO talked about a temporary slowdown in June? Seriously people! As the US markets sell off back into a technically negative levels below the 200ma, Dr. Copper continues to suggest that the panic over a slowdown in China and weak jobs reports in the US are very much overdone. The below real time 24hr price chart of Copper shows little additional impact from the US selloff today and in fact Copper continues to hold up at a very strong $3.26. Not very indicative of a weak China or a slowing US. 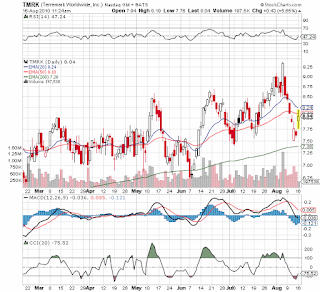 Lihua International (LIWA) has become one of our favorite copper plays beyond the big play of Freeport-McMoRan (FCX). LIWA reported Q2 earnings of $.34 that easily surpassed the estimate of $.28. More importantly though (because analyst estimates shouldn't rule valuations) the stock trades at only 4x the EV of roughly $160M. LIWA has $85 in net cash on its balance sheet and generated a whopping $9M in cash for Q2. This market has become unreasonably brutal. Cisco Systems (CSCO) forecasted revenue growth of 18-20% for the next quarter yet the stock is getting absolutely whacked after hours. This is for a company trading at only 12x 2011 estimates around $1.8. The market has lost all touch with valuation measurements. With $40B in cash, CSCO only has a market cap of $95B and earnings to exceed $10B. Trading at 9x EV is obscene for a company basically growing at around 20%. Even the CEO John Chambers commented about how the market doesn't believe they can continue to grow at the high end of their long term growth rate of 12-17%. Another stat that continues to confirm a slow but steady recovery. Contrary to the huge down day today on fears of a double dip, most of the economic data continues to suggest the economy is making very positive progress. Whether the drop today is due to slower growth from China or the meaningless lagging words from the FED, it's clearly disconnected from reality. The Ceridian PCI is a measure of the diesel traffic used in the US. According to their information, traffic increased by 1.7% in July and over 8% from last year. So after a weak spot in June, the market appears to be back on track. Not to surprising considering the US economy is growth and global economies like China continue to grow at a fast clip even if its down to say 9% from 12%. It still adds up to increased traffic and hence growth. Interesting how a 22% jump in imports causes the markets to fear a slowdown. Guess it's all about perspective, but seriously all the reports focus on the % of increase versus the raw numbers. Actually can't even find a report that compares the raw numbers though the exports were supposedly a record. China markets dropped nearly 3% today so it had a huge impact on the markets, but was it really warranted. The markets never seem to under that slower growth is still growth. Slower growth still requires more copper, iron ore, coal, and oil then last year. Finally some news from Puda Coal (PUDA), Chinese coal consolidator, on funding for them to acquire and consolidate 6 more mines in China under Phase II of the Pinglu Project. Being that PUDA has a market cap of roughly $200M, a lot of uncertainty hung over the stock due to the expected $150M needed to acquire these 6 mines and then upgrade them. Not to mention another 4 mine project in the works as well. That's a lot of dilution feared by the market unless they found a partner so it's likely held the stock price down. Now PUDA has come to an agreement whereby the Chairman and an outside party will contribute 60% of the funds allowing PUDA to keep 40%. Considering the profitability it would've been ideal to see some type of government loan for a % of the deal, but PUDA is still obtaining these mines at very accretive levels. Not sure yet what this deal does to the targets for over $2 in EPS next year, but it shouldn't hurt. July was a good month as this portfolio regained a significantly part of the losses from May/June. A lot of the issues that we incorrectly thought wouldn't impact the markets were mostly resolved during July providing for the strong market reversal. In the end our theory was correct, but it took the market a couple of months to accept it. 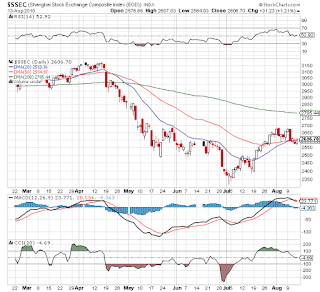 One of the biggest concerns in the market was the slowdown in China leading to a major bottom in the Chinese stock markets at the start of July. This major reversal of a leading market that peaked in December is leading the way for this global market advance. At these levels, China still needs to gain 20% just to return to the recent April highs so the gains have likely just started. The stock for HIG is dropping after hours due to the usual confusion surrounding their earnings. The key is that adjusted earnings of $.92 beat estimates of $.76 and that core earnings were weak due to a DAC unlock charge and several one time charges. Nothing to fret about with the stock trading at $23 and the book value jumping to $41 in the Q. Look for a rebound tomorrow as sanity returns following a through review of the financials. A very profitable company should not trade below book value. The question should be the appropriate bv multiple hence we continue to hold this stock as a core investment. After some weak numbers for June, alot of the economic data for July is started to come in ahead of estimates. Clearly June was a pause because of the fears in the global economy due to the various issues repeated ad nausem. Now with just about all of the issues out of the way including news today that some 75% of the oil leaked in the Gulf of Mexico having been captured or evaporated, the economy can get back to its recovery. Today the July ISM Services or non-Manufacturing report came in at a strong 54.3 up from the 53.8 in June and easily above estimates that expected a decline. The Business Activity index remained a robust 57.4 showing that growth is likely above the headline numbers that tend to be sentiment based. New Orders rose to 56 and Inventories and Prices Paid relaxed from levels that were too high last month. Millicom Cellular (MICC) remains one of the cheapest ways to play the mobile internet revolution and the growth in Latin America and Africa. Due to global growth and the demand for commodities, Africa is becoming a major growth story and MICC provides one of the few investment options. MICC has cellular operations in the following 7 African countries with the associated market ranking: Chad (2), DRC (1), Ghana (2), Mauritius (2), Rwanda (3), Senegal (2), Tanzania (2). With 12.2M customers and a population under license of 169M, MICC has huge growth ahead. Cellular remains the only viable option in most of these countries. 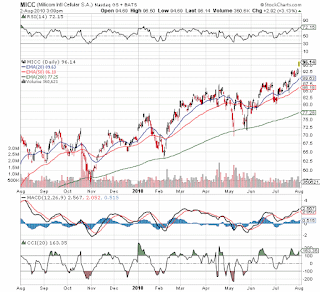 Not surprisingly MICC is hitting a new 52 week high today. MICC will remain a solid position in the Growth Portfolio for a long time. Demand in the technology sector continues to be questions. Everybody is so concerned that the cycle has peaked in the semi sector. Some of this is understandable after the Dot Com crash in 2000 and the Great Recession in 2008. Still demand seems to be building for new applications like mobile internet, 3D tv, and cloud computing. Several of the stocks in our portfolios like Teradyne (TER), TerreMark Worldwide (TMRK), and Riverbed Technology (RVBD) should just be soaring on the Insatiable Bandwidth demand from all these new products. Still only RVBD has broken out but that took explosive earnings.